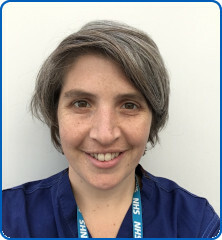 Dr Anna Bibby was appointed in 2018, having completed her speciality training in respiratory medicine and general internal medicine in the Severn Deanery in 2015. As well as a brief period working for Medicins sans Frontieres (MSF) in Mozambique, she spent three years working towards a PhD in mesothelioma at the University of Bristol. She maintains an active interest in clinical research, and holds a personal NIHR research fellowship with the University that allows her to run several mesothelioma trails alongside her clinical commitments. She is co-lead for Lung Cancer Services at North Bristol NHS Trust, and sits on the steering committee for the British Lung Foundation Mesothelioma Research Network. She ran the Europian Respiratory Society Taskforce on Malignant Pleural Effusions and is a member of the 2018 British Thoracic Society Pleural Disease Guideline group. She sits on the faculty for the British Thoracic Society thoracic ultrasound training course and the European Respiratory Society ultrasound and pleural procedure courses.